In this series of blogposts, I’m looking at ways to decorate your house on a budget. I’ve combed the web for ways to brighten up your home without lightening your purse. Last time we looked at cheap ways to revive your living room, and this week I’ve got some top tips to revamp your kids’ bedroom for less. The great thing about doing up the kids’ room is that you can get them involved too. That means less work, more fun, and the kids get the chance to put their own mark on their space. What’s not to love?! When I was younger, doing a puzzle rarely went well. Ours were almost never complete, usually because the dog thought a puzzle piece would make a tasty snack or because my brother had decided to hide all of the corners. If you have puzzles that are incomplete or never played with, this DIY idea is a great way of putting them to good use. 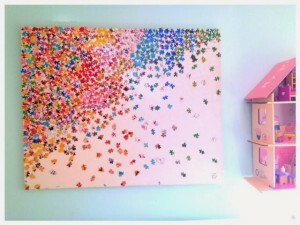 All you need is a canvas or blank piece of card, an old puzzle, and some glue. 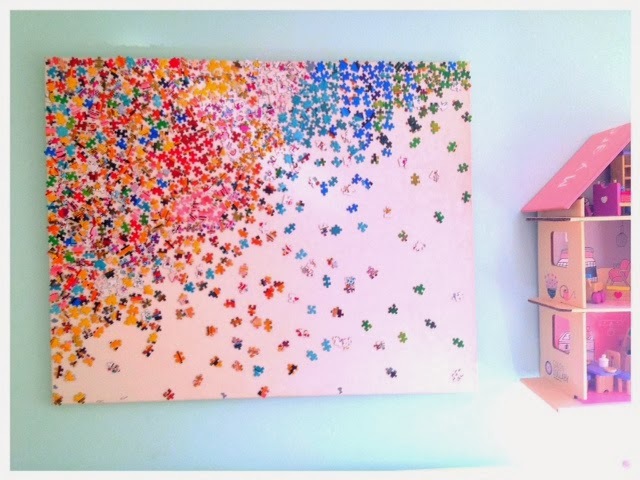 Experiment with the puzzle pieces to make a pattern or scatter them at random before sticking them down. You have a blank canvas (literally) so get creative! From kids’ toys to stationery, the biggest question is “where do you keep it all? !” For simple storage solutions on a budget, look no further than your old jam and sauce jars. 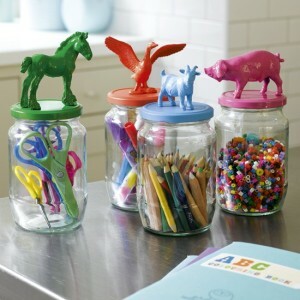 They may look a bit boring, but they can easily be customised and made into fun storage pots for your kids’ stationery. Glue plastic figurines to the top of the jar and spray with brightly coloured paint. If you’re looking for a way to capture the imagination of a young explorer without it costing the earth, try this budget bunting. It’s made out of a few old maps, which you could pick up from a local Tourist Information centre. Alternatively an old road map would work just as well. 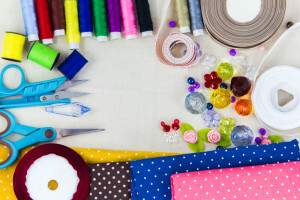 You’ll also need tape, string, a pencil, a pair of scissors and a spare hour or so. 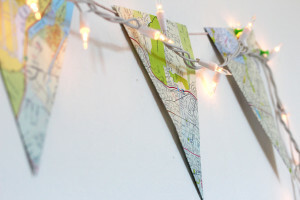 You could even twist some fairy lights through the bunting for an extra sparkle! Watch this online tutorial for instructions. Maps are incredibly versatile and can be used in all sorts of DIY craft to brighten up your home. Take a look at these 35 creative ways to repurpose a map for more inspiration. Rather than throw old pillow cases away, they can be repurposed as floor pillows with little more than a needle and thread. Not only are these floor pillows cheap and easy to make, but they’re really handy to have around. 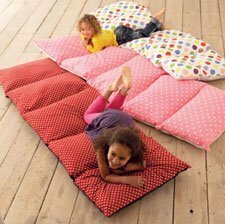 They make great play mats, extra seating space, or pile them up for a comfortable place to read a book or watch a film. Just because your child has outgrown their cot doesn’t mean it can’t be made into something just as useful. 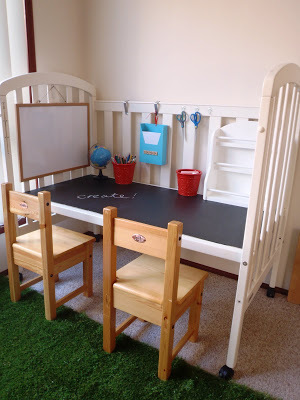 With a bit of imagination and some chalkboard paint (which you can buy for a couple of pounds at DIY shops), you could turn it into a children’s desk. The end result is very cute! For more money-saving tips and budgeting advice, sign up to our monthly MoneyAware newsletter. If you have any handy hints when it comes to decorating on a budget, we’d love to hear from you in the comments!